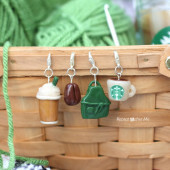 Making spirits bright with these Bernat Crochet Bottle Toppers! I always bring a bottle of wine to my friends who are hosting holiday parties, book club, family gatherings, and other get-togethers. And now I can add a little personalization with a crocheted bottle topper in these two fun Christmas characters! Santa and Rudolph both work up quickly and will definitely bring a smile to any hostess! 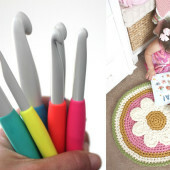 The Free Bernat Crochet Bottle Topper pattern is available in the new Yarnspirations Holiday Gift Guide! Just a couple notes about the pattern. 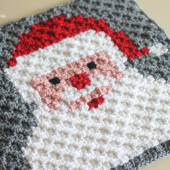 I ended up using black safety eyes on my version and I crocheted a row of tan color in the back loops of the beard for santa (instead of crocheting circles separately). I especially love how Rudolphs nose is made! 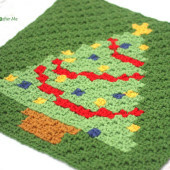 You will crochet a bobble stitch right into the round with red. So no need to add it later. Very clever design by Yarnspirations! You can find the cute Christmas wine labels HERE on Amazon (affiliate)! The come in a pack of 12! Can’t wait to see you make dozens of bottle toppers! Be sure to tag #Yarnspirations and #RepeatCrafterMe when you post your creations on social media! Santa and Rudolph are coming to town!